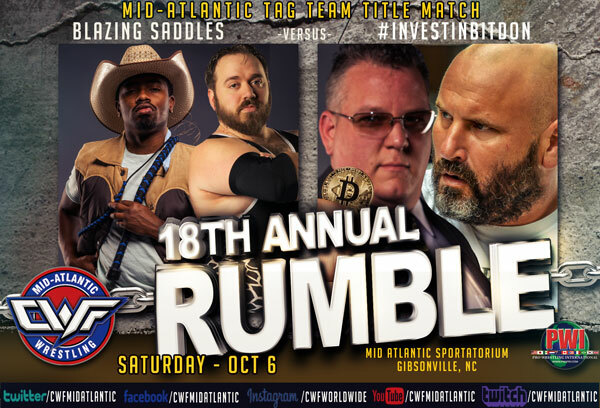 CWF Mid-Atlantic presents “The 18th Annual CWF Rumble” on Saturday, October 6th, at the Mid Atlantic Sportatorium in Gibsonville, NC! This annual event is always one of the most popular nights of the year! 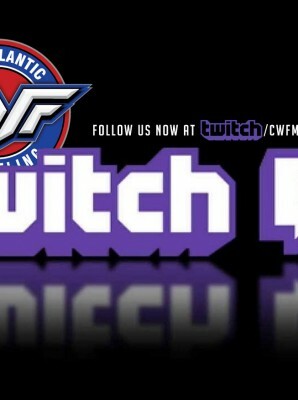 Be sure to secure your seats by purchasing your tickets in advance at cwftickets.com! The FIRST 30 PEOPLE THROUGH THE DOOR will get to draw a number as they enter. 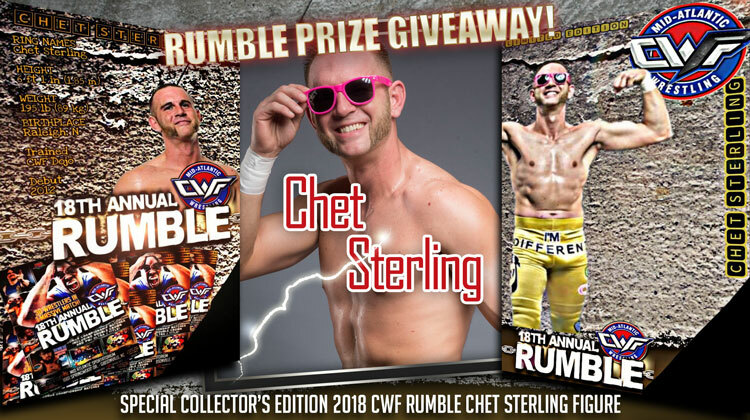 If your number is the same number of the entrant that wins the Rumble… YOU WIN A SPECIAL PRIZE!!! Please remember that all VIP Ticket Holders and Kernodle Club Ticket Holders get to enter the building before any General Admission Ticket holders are admitted. The Rumble will see two wrestlers start in the ring… with a new wrestler entering the ring every 90-seconds!! The only way to be eliminated is to go over the top rope and touch the floor!!! Whoever is able to survive to the end gets their name on the CWF Rumble Plaque and a guaranteed title match for the championship of their choice on a future event! 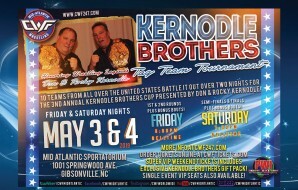 This is the opportunity for anyone entered to attain a title bout that they may never receive any other way!!! The Rumble has seen many winners vault up the ladder and use the victory to cement themselves to a championship contender!!! Wrestlers from all over the country… and even from other countries have been in contact with the CWF Officials to try and gain an entry into this mega-match! So far the only thing we know is that Aric Andrews will be in the highly advantageous position of the Number 30 slot. Andrews’ name was drawn at random at “Gold Rush” to score that spot. We’ll be announcing more entrants to the CWF Rumble as well as the bonus bouts for the evening. Double Crown Champion, Trevor Lee, has already informed the CWF Championship Committee that he will be in attendance and would like to defend one or both of his titles. 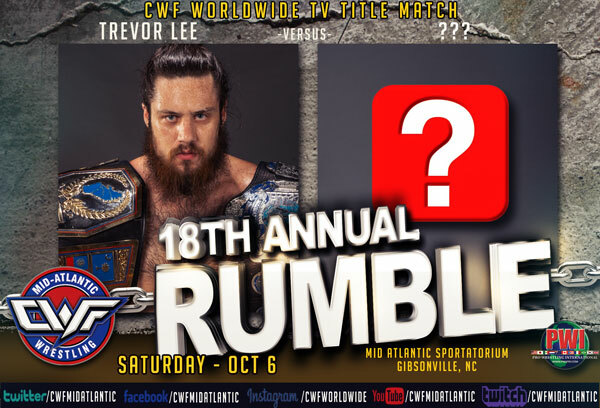 At the Rumble, an opponent for Trevor Lee will be drawn at random for his CWF Worldwide TV Title! There will be an extra stipulation to this title defense. 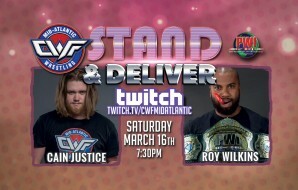 Should the opponent win the match OR last the full 10-minute TV Title Limit, they will automatically be given a Mid-Atlantic Heavyweight Title Match on an upcoming live event!!! What an opportunity one lucky wrestler will have to not only raise their stock value but also perhaps capture the crowns held by Trevor Lee! 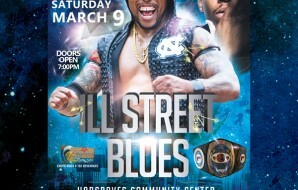 PWI President William L. Cross has also let us know that PWI Ultra J Champion, Cam Carter, will be at this event and will be defending his title as well! Donald BitDon & Otto Schwanz made quite the impact at the previous CWF event, “Gold Rush.” Prior to the event, Director of Marketing for BitDon, Khan O’Kelly, sold their tag team title shot to Ethan Alexander Sharpe. However it came with an unannounced bonus… being attacked by the BitDon inventment company!!! BitDon & Otto crashed the match and beat up everyone causing the match to be thrown out. Now at the Rumble, BitDon & Otto will challenge “Blazing Saddles” for the tag team championships! The monster team of BitDon & Otto will have the size, strength, and experience advatanges. But one thing is for sure, Sheriff Kool Jay & Marshal Michael McAllister will have the heart!! Can heart overcome all the odds to prevail? Or has Khan O’Kelly positioned his team to invest in tag team precious metals??!! 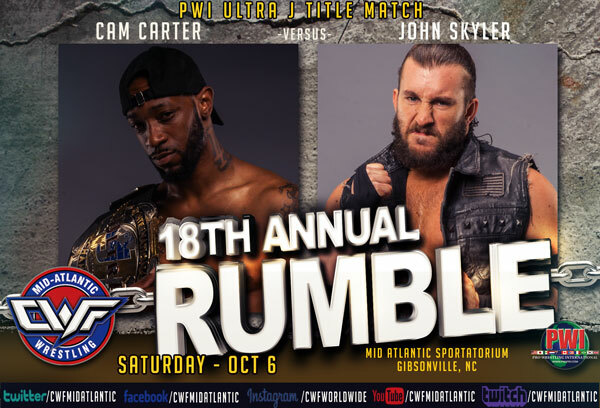 PWI President has announced that reigning Ultra J Champion, Cam Carter, will defend his title against “The Southern Savior” John Skyler! Skyler defeated Carter in the Finals of this year’s Johnny Weaver Cup Tournament in August. That victory influenced Cross to sign this rematch between the two only this time it will be the Ultra J Title belt on the line!!! Much more to be announced in the coming days!! !